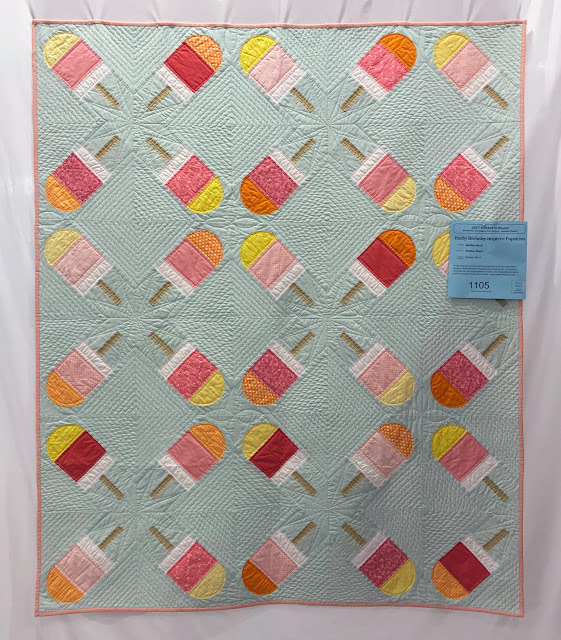 This past weekend was the annual Washington State Quilters' Quilt Show which I not only entered four quilts in but also worked in the Inland Northwest MQG booth at the show selling raffle tickets, which you can still buy, hint hint. Needless to say it was a busy weekend. I didn't win any ribbons this year but Patti Baymiller ( @mizzoupatti ) used a modified version of my Urban Trek pattern for her Hoffman Fabric Challenge entry which was such an unbelievable sight! Patti had let me know she was using the Urban Trek pattern but it was a total surprise when she let me know it would be in Spokane, too cool. 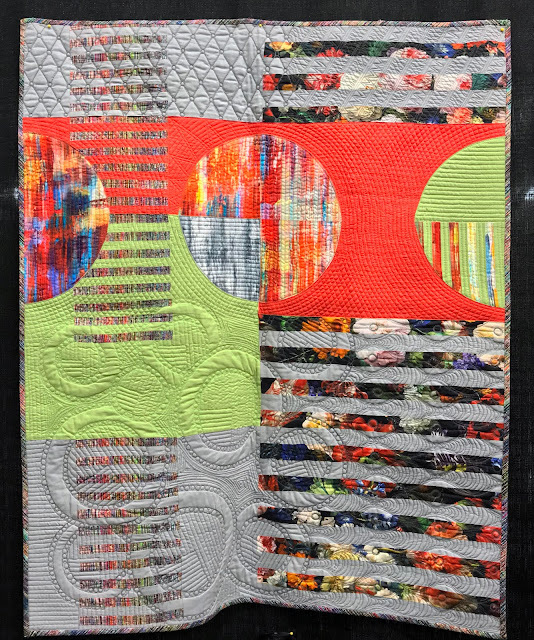 I just love how she used the challenge fabrics and her quilting is so creative for an overall beautiful quilt! As for my quilts... 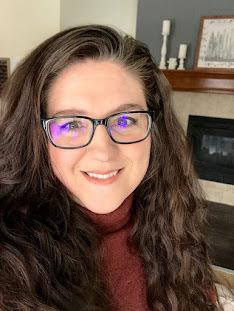 I wasn't sure which were going to be available for the show this year so I submitted four that I knew wouldn't be going anywhere this fall. This year I elected to have two of my quilts judged (Retro Rollers and Quarter Hours) and two were entered as general submission (Graffiti Rings and Busby Berkeley Inspired Popsicles). The judges notes on Retro Rollers were a bit hard to swallow. It scored an 87 out of 100 possible points, sad. The first section was design and originality and it only scored 17 out of 20, ugh. Not a good or original design, that hurt, but then it just got crazy. I missed 3 more points on cleanliness, WHAT... did I read that right. Everyone of my quilts are washed, with detergent, blocked, dried, then stored in the "forbidden" spare bedroom laying face down, flat on a queen size bed until it is finally packed up into a jumbo zip lock bag and transported to it's next location. My quilt was clean when it left my house I'm not sure what may have happened after that. I also lost at least a point, if not two, for not stitching in the ditch. I didn't stitch in the ditch because it didn't add to the design, oh well. Quarter Hours fared a little better scoring 92 points. The funny thing is I know it was not constructed as well as Retro Rollers, I didn't square a single block on Quarter Hours but all the blocks on Retro Rollers were squared. 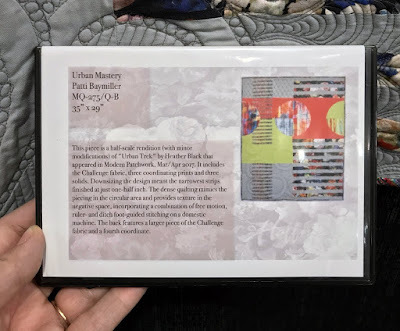 Basically the feedback was the same I got from AQS, your piecing and binding are great but work on your quilting and I continue to work on it all in hopes of winning a ribbon even at an uber traditional show like WSQ. Definitely a show full of highs and lows but I love this show and look forward to it each year. Lastly, I've been working on a logo for myself. I'm not a logo designer so I'm taking my time and tweaking it little by little. I like where the logo is headed but it's not quite there yet. I like that I can piece the stylistic "Q" if I keep it as is. oh that's interesting/weird about the comments on your quilt! ;-/ Sorry about that!! On the other hand, I really like where your logo is headed! Yeah, it was difficult to read but I'm determined to do better and improve my quilting. Logos are hard! There's such a fine line between cheezy and eye catching. Then on top of that they have to communicate so much with so little. Your logo is very cool ! I love Retro Rollers and it looks original to me ... Difficult to hear / read a criticism even though constructive ! Thank you Sophie! I'm usually really good with accepting judges comments but Retro Rollers stung a bit. I wasn't expecting the "your quilt should be clean" comment especially since I try to hard to keep my show quilts pristine. Overall I think judges comments are very useful. I'm glad for you to be willing to receive and share comments you receive from the judges. I've entered so many quilts, and received so many judges' comments over the years that I'm pretty much ambivalent about it. 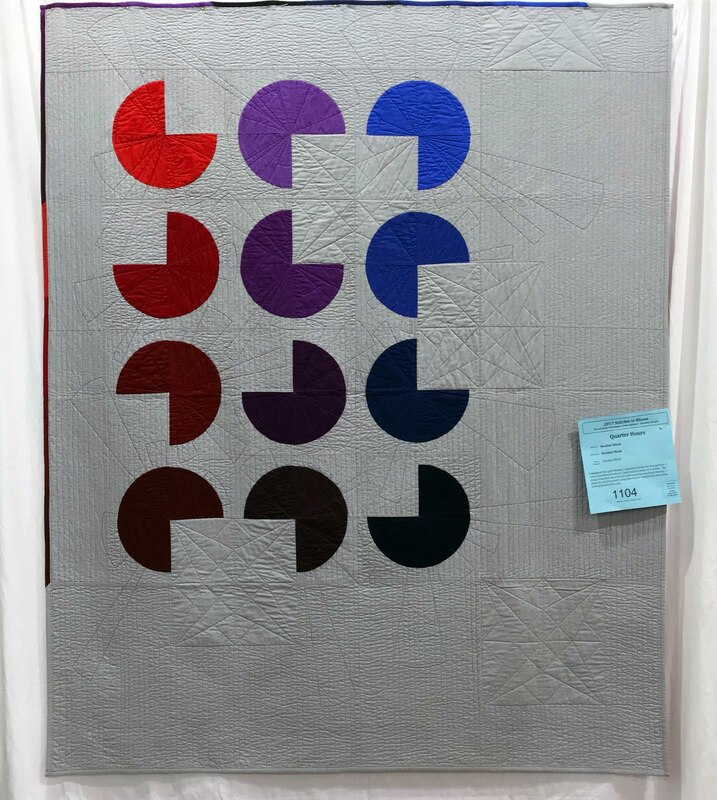 Judges have taught me not to put much stock into what they think about my quilt. Though sometimes they're right about a critical point, they're also sometimes wrong. I still remember the quilt I designed and made using entirely Aboriginal prints purchased in Australia, and the judge commented on my nice use of Asian prints. Yep, sometimes they're just flat-out wrong. 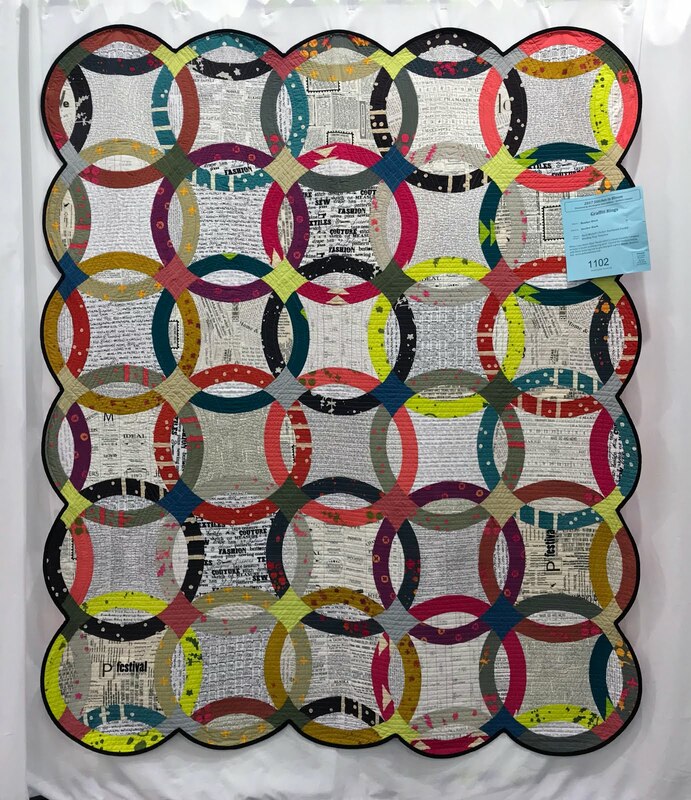 So if I enter a quilt in a show, I don't care what they have to say. If I was to make a prediction, I would say that in another 15-20 years of entering shows, you won't care either. 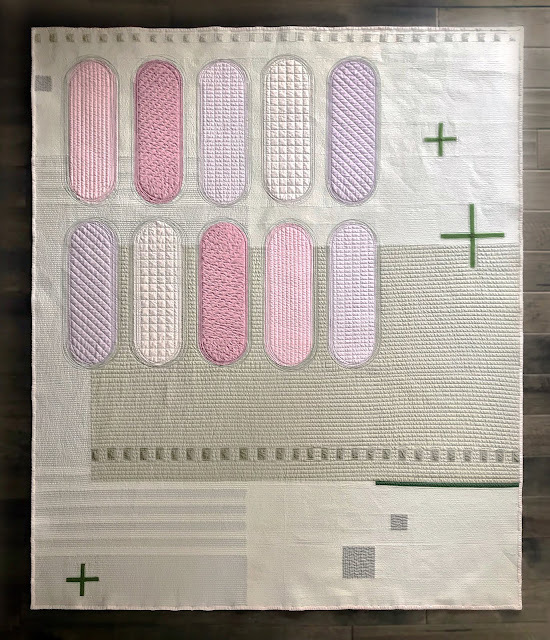 We just love making quilts that we love! Yeah, I'm already learning to take them with a grain of salt. 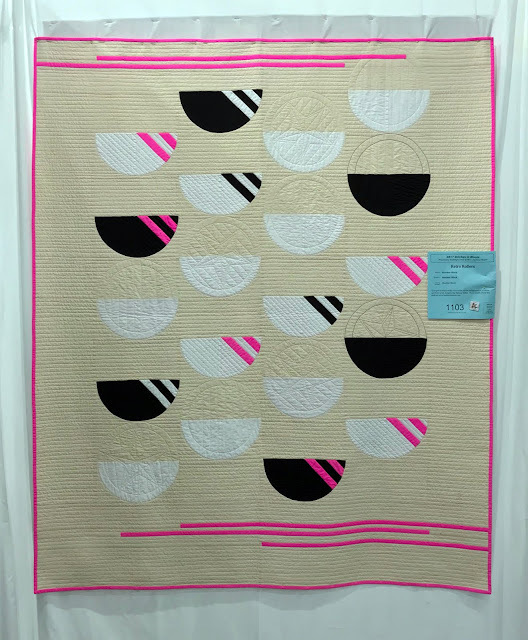 It's crazy how some of the comments just don't apply but I suppose if I was judging 100's of quilts in on sitting I'd probably come up with a sentence or two to use over and over. I hope by sharing the comments people will be more willing to enter their quilts in shows, especially modern quilters. I really want to see more modern at shows.